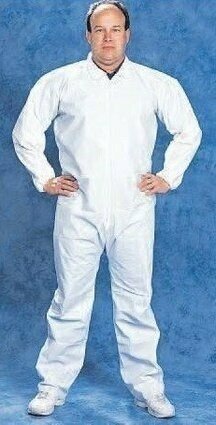 Tian's 216850 microporous coveralls. Latex free / lint free film coated coverall for use in critical and low particulate clean environments. Suitable for exposure to bloodborne pathogens, some hazardous liquids, and where liquid splash is a concern. Features include a zipper front entry, and a storm flap zipper cover. Fabric is constructed from a blend of polyethylene and polypropylene into a unique breathable membrane. The finished fabric also contains anti-static properties from a proprietary additive. Individually inspected for sizing, stitching and workmanship.